I think you should read the books I tell you to read. They're good. 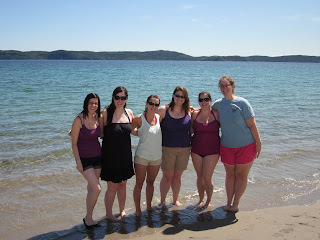 I roadtripped again this past weekend, back to Gander, with four fabulous friends: Jen, Laura W, Laura S, and Steph. We trekked across the island to visit Kayla. The girls haven't seen her in quite a while, and they wanted to see her new house and her new "hometown". It was a perfectly lovely weekend, enhanced by the fact that the sun decided to make an extended appearance. We spent Saturday on a sandy beach in Eastport, tanning and numbing our feet in the Atlantic and climbing forbidden sand dunes... well, I climbed forbidden sand dunes. Everyone else looked on, lackadaisically telling me I shouldn't do it and taking incriminating pictures. "You'll stay with me?" "Until the very end." "Harry Potter. The Boy Who Lived. Come to die." Last night I saw the 12:01 showing of Harry Potter and the Deathly Hallows: Part 2. We waited in line for close to five hours, combated sleepiness and fought for good seats, and at long last and too soon, the final installment of the Harry Potter began. It's hard for me to express my feelings about the movie and the books and the end of the whole saga. Harry has been a part of my life for 12 years. I was among the generation of readers who started the Harry journey from the beginning, having to wait a year, sometimes two, between books. I loved everything about the Harry world and relished the hours I spent living it through Rowling's words. I dedicated close to a year of my undergraduate degree studying the stories, reading criticism, and loving the story and characters more than I did before. I read Veronica Roth's book Divergent last week and I've been wanting to post about it, mostly because I'm not entirely sure how I feel about it. Divergent is the first in a trilogy, of which books 2 & 3 are yet to be released. Like all good young adult novels, Divergent is set in a dystopian Chicago where the city has been divided into five factions of people: Amity (the kind and peaceful), Candor (the honest), Erudite (the intelligent), Abnegation (the selfless), and Dauntless (the brave). Each child is raised in the faction of their parents, learning the rules and art of being kind or brave or selfless. 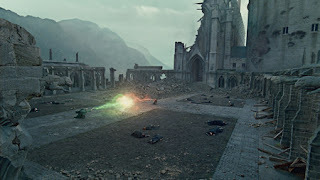 At the age of 16, each young adult may choose whichever faction suits their inherent personality; if they choose to leave their parents' faction, they are divorced from their family forever. I love traveling. I love airports and long car rides and not feeling guilty about eating ice cream at 10am or spending $5 on a pack of gum because - hey! - I'm traveling. I love being somewhere different and the unparalleled energy that comes from just being in a new place. For a long time I thought that "traveling" meant I had to go somewhere completely foreign, where they don't speak English and the bread of choice is in funny shapes and unfamiliar colours. Over the past year, though, I've come to appreciate even the smallest distance traveled. Just the act of getting there, being with people both familiar and infrequent, is enjoyable. Stepping outside of my daily norm, even for a few days, is enough for a recharge. "She is a bit adorable. Bit annoying. Right on the cusp." who'd've thunk the 80s would ever be a tag?